Last week I purchased the Ladurée Sucré desserts book and I've been totally smitten ever since. 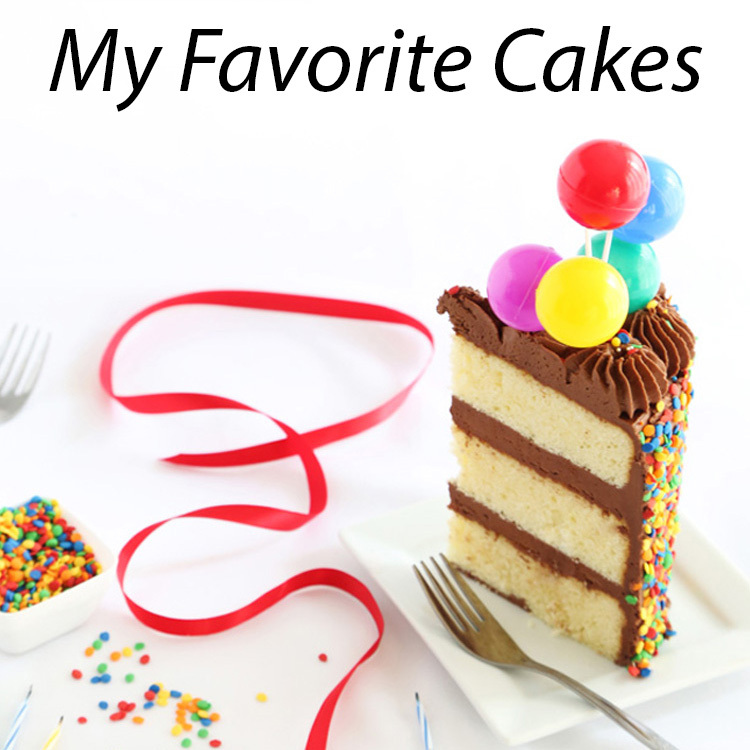 One recipe from the "Large Cakes" section caught my eye immediately. Harmonie. It is less cake-like and more like a giant pistachio macaron. If I understand correctly, this dessert is usually made in single servings (bigger than a normal macaron and smaller than a cake) however, the author has adapted a 10-inch version for the book. The macaron recipe was much different than mine, and I was nervous when the text didn't give any visual cues on how the batter should appear when properly folded. My instinct was to scrap Ladurée's recipe and make my well-practiced one. Then I had a moment of introspection. When did sticking to something comfortable ever result in learning something new or bettering yourself? Okay then. I went by the book, and look. It worked! I call this version Harmonie Chantilly, because I didn't make the pistachio mousse filling (terrible, I know). With wedding shower preparations and an impending trip, I simply ran out of time -and steam. I opted for a simple creme Chantilly and I used more than necessary. When has that ever been a bad idea? I also made the overall dessert smaller. This one is a 7-inch cake and I had plenty of leftover batter to make three dozen macaron shells. In addition to dessert, I wanted to give a little something extra. 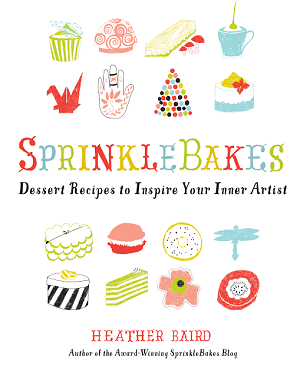 My favorite printer in all the land, MOO, is supplying gorgeous picture postcards of treats from the book. I've been hooked on their products ever since ordering these business cards last January. They are of the highest quality and you'll know that the minute you have them in your hands. The postcards are no different and I am so thrilled with how they translated my photographs into their printings. I can't wait to hand them out and I just might frame one or two! 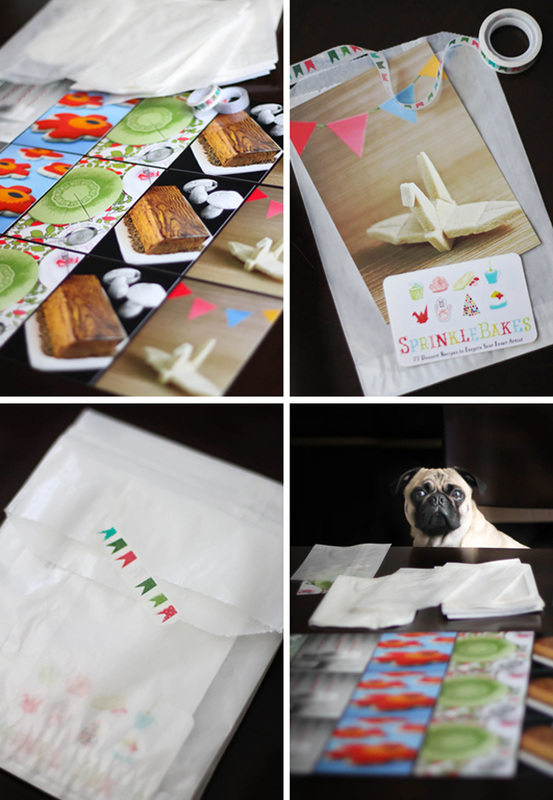 Glassine bakery bags and washi tape packaging; Biscuit helped. One more thing. I'll be at Book Expo America (BEA) in New York this Monday at the Blogger Luncheon from 12:30-1:30. If you're attending, stop by my table! Notes: Although cups are listed, I used and recommend using a kitchen scale for this recipe. Line 2 baking sheets with parchment paper and draw a 10-inch diameter circle on each. Combine the ground almonds, pistachios and confectioner's sugar in a food processor and pulse to obtain a fine powder; Sift or strain through a sieve to remove any lumps or coarse pieces of nut. In a clean dry bowl, whisk the 5 egg whites to a foam. Once hey are frothy, ad a third of the granulated sugar and whip for another minute; finally add the remaining granulated sugar and whip for 1 more minute. Heather's note: Egg whites should be whipped until a thick, shiny meringue forms - this will probably take longer than the suggested 1 minute. It did for me. Using a rubber spatula, delicately fold the sifted mixture of ground almonds, pistachios and confectioner's sugar into the whipped egg whites. In a separate small bowl beat the remaining 1 egg white until very frothy. Add to the final mixture, along with a few drops of green food coloring, folding gently to loosen the batter. 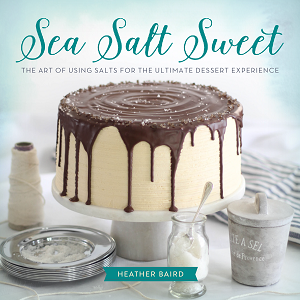 Heather's note: The batter is done when it falls in a ribbon from your spatula, as explained in previous recipes. Transfer the mixture to a piping bag fitted with a plain tip. On one of the baking sheets, pipe a neat ring of macaron batter, following the drawn circle, which will serve as the border of the cake. On the other prepared baking sheet, pipe a disk of batter in a spiral, filling in the drawn circle. Allow the piped batter to rest uncovered for 15 minutes. Bake the macaron ring for approximately 15 minutes and the disk for 20-25 minutes. Remove from oven and allow to cool completely. Do not try to remove the macaron ring from the baking sheet when it is still warm - it will break! Place the macaron disk upside down on a serving platter. Transfer Chantilly cream to a piping bag fitted with a large star tip. Pipe cream in onto the disk. Carefully remove the macaron ring from the baking sheet and place on the cream. Pipe stars of chantilly cream around the outside of the macaron disk. 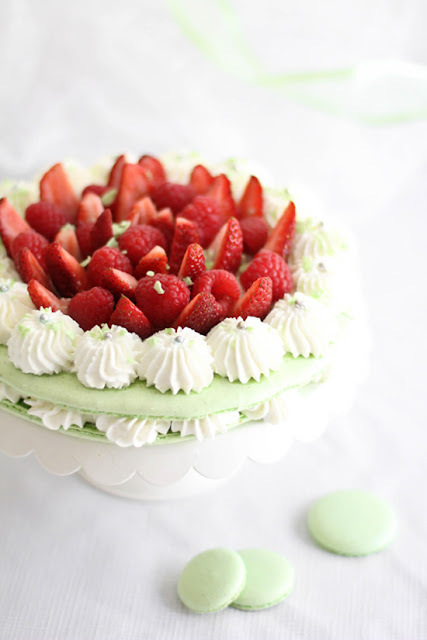 Slice the strawberries in half lengthwise and arrange in a decorative pattern in the center. Top with raspberries. Sprinkle ground pistachios over the berries. It's so amazing.... I love it! A splendid cake! So perfect and extremely tempting. Wowwwwwwwwwwwww, Heather I will be, sure. I'll inform to you...Sorry for my English, and thank you so much for your wonderful recipes. 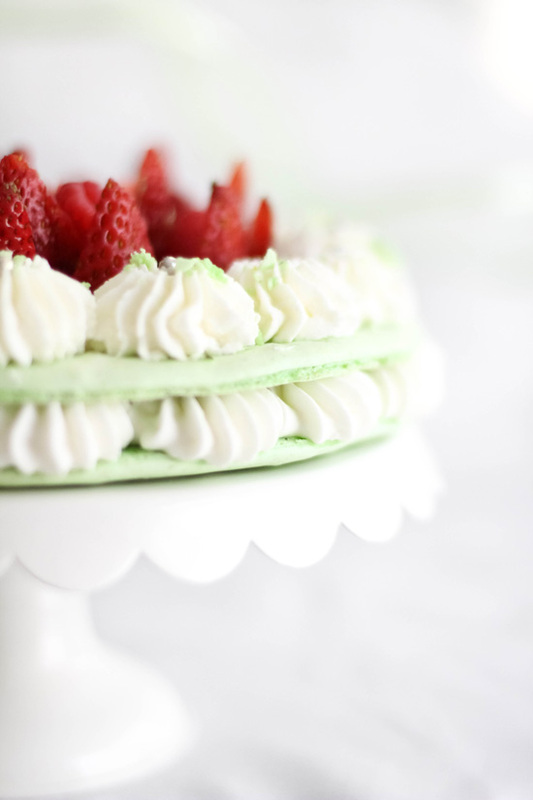 I would have never thought to make a macaron cake - this looks lovely! Thanks for sharing! You should stop by Chattanooga some time! ;D I'd be the first in line. You amaze me..this cake is absolutely stunning! Does the batter rest for 15 mins and *bake* for 20-25 mins? I'm definitely going to try this recipe! Beautiful pictures. Hi Fran! Thanks for catching that. I have corrected the recipe. It should read: "Allow the piped batter to rest uncovered for 15 minutes. 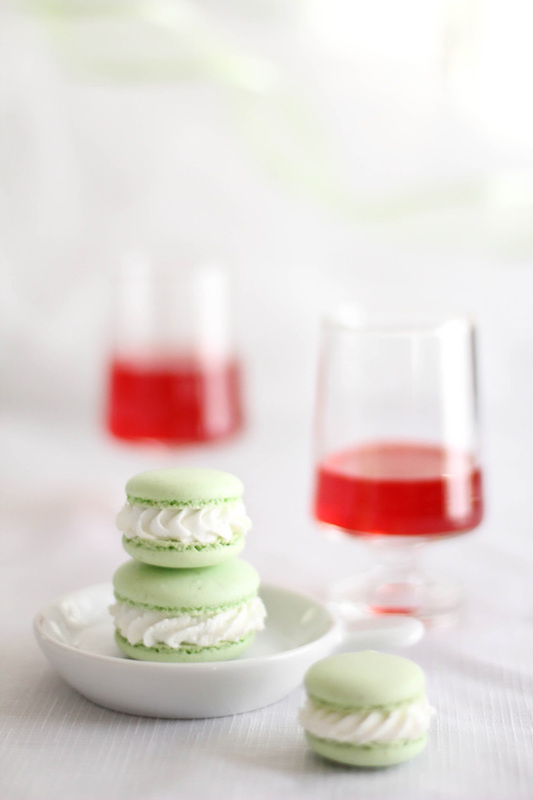 Bake the macaron ring for approximately 15 minutes and the disk for 20-25 minutes." Gorgeous. A giant macaron is just crazy but love it so much. That looks amazing! I have always wanted to learn how to make macarons.....I might just work up the courage to try! Your blog is amazing! Thanks for sharing. The only word for this recipe is "fabulous." You're amazing, as always. This is gorgeous! Looks so amazing! I've always wondered why Laduree macarons had a narrower foot than the ones I make- do you feel like this recipe gave you a different aesthetic for the macaron shells? Also, was the taste any different from others you've made? Did you age the egg whites? I'm definitely going to try this recipe- thanks! So beautiful! And you can tell that your macarons are practically perfect in every way. Truly stunning :) You are such an inspiration. Love your artistic vision. Looking forward to getting your book! I asked for it for my birthday. Oh, Heather...I'm so happy for you. It is so dreamy looking at your creations and reading about your exciting life. Good luck and enjoy the Book Expo in NY. oh i wish i could stop by your table! That is seriously the most beautiful, delicate cake I've ever seen! I didn't realize it was a ring on top. It looks wonderful! Your creations always look wonderful. Any chance of a DC visit? I just received this book for my birthday last week as well! I can't stop staring at it! I don't even know where to start! This looks amazing. Congrats! Amazing photos! I just can't stop looking at them. I always imagined baking macaroons would be impossible but this recipe looks totally doable. Inspired! oh my gosh that is a GORGEOUS cake!! i love love love macaroons --- they're GF!!! thanks for sharing such a beautiful post! Your creativity never ceases to surprise me. What a fabulous cake! Was it hard to cut into pieces at all? What a great idea for a cake! I haven't really had success with normal size macarons and here you are with a perfectly beautiful, giant cake size macaron:) The contrast of the berries is stunning! Hey! Great way to use up the six egg whites that I have left after making the 7 Sins Chocolate Cake! :-) Which, btw, I ended up needing to make the icing with white chocolate - but I think it came out heavenly with the white, drizzled with the darker chocolate. Bravo!!! C'est magnifique! Ladurée est la référence chez nous en matière de macarons et je te félicite car tu les as très bien réussi! You did a great and amazing photography too!!! I would like to taste your wonderful "cuisine" (I am fond of all your recepies!!!) but I'm sooooo sad 'cause I'am french... so I think that's not gonna happen soon! Hello dear artist, your blog just let me speechless...COMPLIMENTS FOR EVERYTHING!!! Is that ever neat! I completely have not had the courage to try macarons yet, making ones this big would scare the crap out of me! So kudos for your courage, and how lovely this turned out. 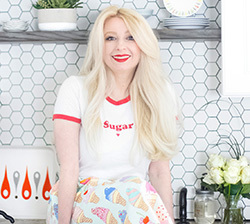 By the way... are you okay with a recipe from your book being shared on someone else's blog? I just made your coconut & fruit sushi and I really want to share all about it! J'étais à Paris en Août et j'ai eu l'honneur d'essayer les macarons de Ladurée. Voir cette recette me donne envie de retourner là-bas. Merci pour ce beau souvenir. Bonjour, Mother. These look absolutely fabulous! How lovely would they be at a wedding or bridal shower?! This is the kind of cake I would eat every day for my entire life!! The way you decorate this cake is beautiful!I Love it! Wow...this is just SO GORGEOUS & what a beautiful concept! Lovely Heather, i found myself in this blog and at the same time i get lost inside your colorful photos. Absolutely you take me to another world, and i feel myself as Alice In wonderland. What a beautiful stuff you make, i can not really take my eyes off you. I am living in Turkey and customs here is a bit strange. Some things ordered get stuck in customs forever. So i ordered your book through my friend who has recently had a vacation in Chicago. So i am praying for a luck that she could find your book there and also counting days for her return. CONGRATULATIONS FOR ALL OF THIS BEAUTY and A BIG HUG FROM ISTANBUL ! WOW! This is amazing! I cant even get the tiny ones right let alone a giant one! This is super cool! 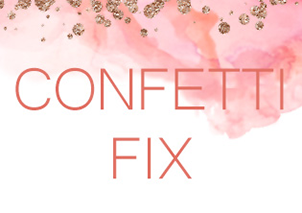 For the 3 dozen macaron shells - did you also draw a circle on parchment paper and fill it in? What size were the circles? And what was the bake time for those? I didn't draw circles, I just piped 1 1/2-inch circles of macaron batter (they will spread making them a little bit larger) and baked them for about 10 minutes. This is on my list of the most inspiring recipes of the week over at Salted Spoon! This is GORGEOUS! Really want to get the book now, thanks for sharing. I have thi book sitting on my shelf and have not had the time (ok maybe I am a bit intimidated by it) to take it out for a test drive. This is a simply gorgeous creation and those shells are enviable! 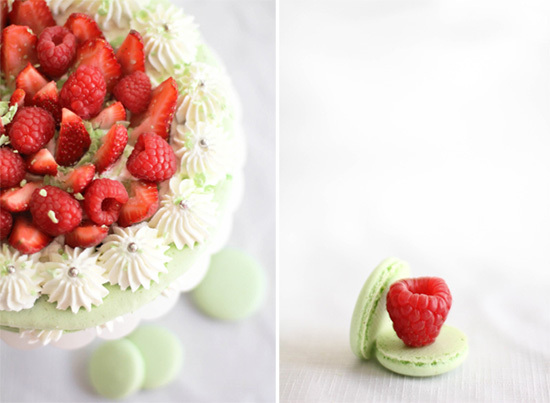 This reminds me of a St. Honoré Cake, but with a macaron, instead of Pâte à choux. Definitely going to try this one out! Two teaspoons is an awfully small amount, so I don't think it would throw off the recipe too much. If I were doing this, I'd decrease the amount of almond flour by 2 tsp. and add in the cocoa powder until 150 grams weight is achieved. I did use gel food coloring. I just put a little on the end of my rubber spatula and it was incorporated as I folded the batter. 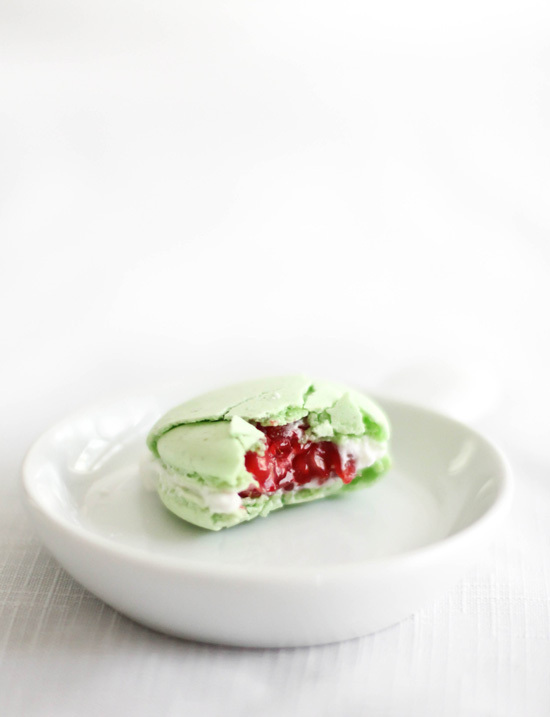 You can make the macaron portion of this recipe and freeze it for up to two weeks. It is very delicate though, so make sure there's plenty of room in the freezer. Just bring the macaron pieces to room temperature before assembly. Definitely assemble it the same day you plan to serve. I hope this helps Tara! That sounds like a great idea! Is the big shell meant to become soft and chewy on the inside like its smaller counterpart? this makes me think about a Key Lime Macaron Pie or something!!! That would be so good! Going to try this one out when the family comes in town next weekend.